Congratulations, you’re getting married! Whilst you’re busy selecting colour schemes, choosing flower arrangements and trying on more dresses than you care to remember, let us take some stress off your hands and provide your luxury wedding transport. Aston Martin is a British icon, each model is carefully designed and hand-finished here in the UK, ensuring an elegant yet impressive choice, perfect for weddings. We have an extensive range of Aston Martins for hire across the UK, allowing you to select the ideal prestige hire car to fit in with your big day. Whether you’re looking for a beautiful car for the bride and her father to arrive in, the extended wedding party or the bride and groom themselves, we can tailor your booking to suit you. One of our professional chauffeurs will arrive looking smart and sophisticated, making sure you get to your venue relaxed and on time. Our clients are always our top priority and your chauffeur will leave you to enjoy your special moments together, concentrating purely on your overall experience. As well as providing the transport to or from the wedding venue, an Aston Martin can provide a beautiful backdrop for stunning wedding photos, a classy addition which is never too over the top. We cover the entire UK, no matter where your wedding is booked, we can get you there. Our wedding packages are completely flexible, allowing you to choose exactly the times you need us for, be it a one-way journey or a car you return to at points throughout the day. We love this idea, it is a well-known tradition for the bride and groom to surprise each other on the big day, usually with a nice piece of jewellery or a beautiful watch to tie in with his or her wedding ensemble. However, it is becoming increasingly popular for the bride to surprise the groom with a luxury hire car on the morning of your wedding, ready for him to drive with his groomsmen to the venue in the most epic style. 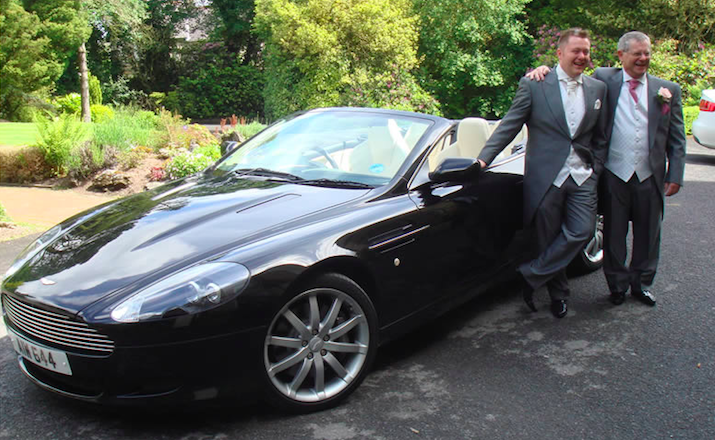 Our fleet of Aston Martins are the perfect choice to hire as a surprise for the groom, allowing any man to live out his childhood fantasy of becoming James Bond for a day. Even if your husband-to-be is not a fan of the franchise, an Aston Martin is an understated yet highly luxurious choice of hire car, ensuring he gets a feeling of true class and decadence on the way to say, ‘I do’. But you don’t have to miss out on all the fun! Each of our beautiful Aston Martin hire cars can be booked as chauffeur-driven or self-drive hire so why not begin the new chapter of your life in the most exciting way possible and drive off together in an Aston Martin Vanquish? Start as you mean to go on, they always say. Use your self-drive hire Aston Martin as you wish, as transport between the wedding and reception venue or at the end of the day to get yourselves to the airport in true VIP style. However you see your wedding day, we can help to make those dreams a reality. 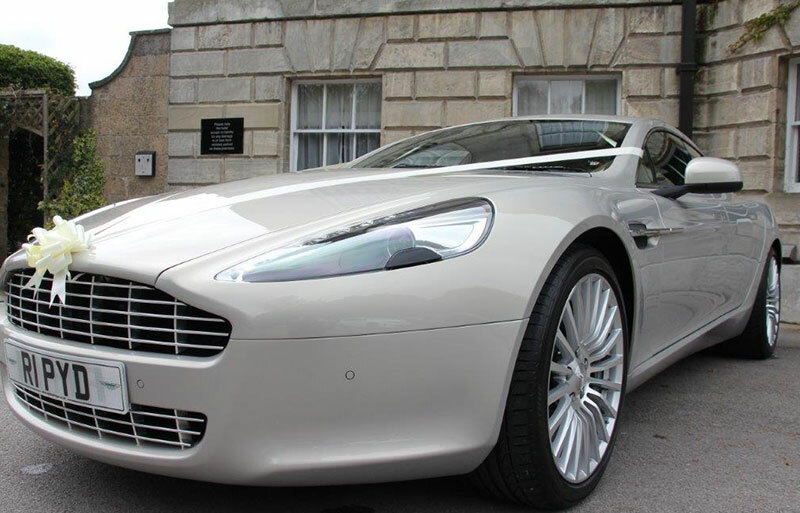 We will take the time to discuss your big day with you, understand your priorities, schedules and needs and get your luxury Aston Martin hire car to any address in the UK, ready for you to enjoy. We can offer advice and recommendations to make sure you make the perfect choice or, if you have a specific model, colour or year in mind to set off the theme of your wedding day, simply let us know. Our team are incredibly good at what they do and if we don’t have exactly what you want as part of our fleet as standard, we will always go above and beyond to source it for you, we understand how important every detail is on your wedding day and want to help to make sure it goes off without a hitch.